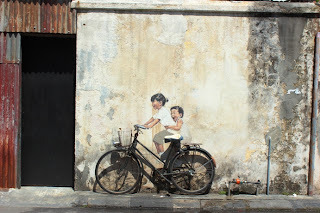 My cheap travel diary... Hopefully it can inspire others on great spots in Malaysia. This free shuttle 'Go KL' may not be new in KL but Cheap Travel would like to share this facilities to all because many people still do not familiar with this. Taking over the concept from some developed countries to encourage people to use public transport this free shuttle 'Go KL' has been introduce since August 2012. There 2 lines/ routes available recognized through their colors i.e. : green and purple. The main hub for purple line is KLCC while green line main hub is at Pasar Seni. It means that, the bus first and last stop is at these 2 points. Both lines meets at Bukit Bintang. For Cheap Travel lovers, this is a great idea to save. We can just park at one spot and can go around KL for free. As far as we concern, the service is quite reliable. This facilities is available from 6am to 11pm daily with free WIFI and handicapped facilities. WOW!!! In terms of frequency, it should be around 5-15 minutes gap depending on the traffic condition. Quite a big gap eh? We also think so, this may be the point of improvement to be considered. Perhaps we can have a digital board telling us when is the next bus coming. Knowing so much advantage and benefit gained by the citizen and tourist, Cheap Travel really hope that this kind of facilities can be extended further to other routes. Your taxi driver refuse to use meter? Feel like you being overcharge? However if there is no taxi counter available, please insist the taxi driver to use meter before you get into the taxi. This is a new route open by Malaysia Airlines. It will commence on 3 Feb 2014. When an airlines open a new route, they will open with promo price. So hurry up!!!! grab your ticket now. MH770. KL-Krabi 2.55pm and will arrive Krabi at 3.40pm. Monday, Thursday, Friday and Saturday. Nasi Kandar, Char Kuey Tiaw, Laksa Penang, Pasemboq etc. Penang is so famous with variety of delicious foods. Its authenticity brings visitors from all over Malaysia even foreigners. Initially that was our main objectives spending our holiday at Penang last month. To nurture our taste bud with local food. On our last day while buying some souvenirs new Chowrasta Market, we were attracted to rows of fridge magnet showing all the murals in Penang. Found them so attractive, we determined to find all of the murals. At first we thought it is difficult to find them. 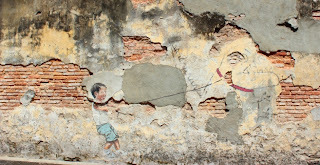 When we found one, actually there was already stalls nearby selling souvenirs and map to the murals. Close to our location, there are some other murals at walking distance. 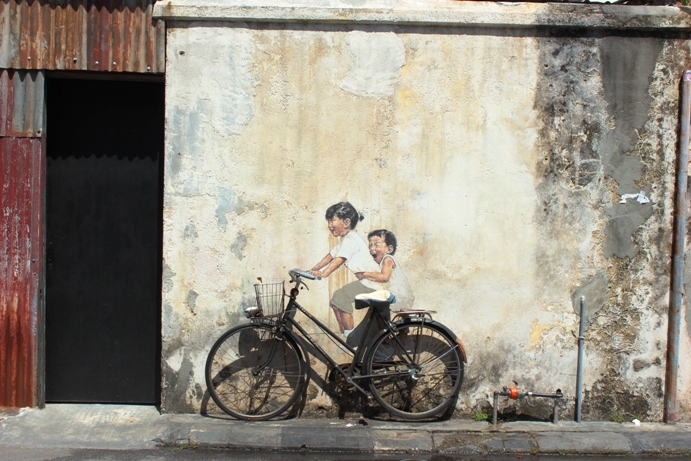 Little Children on a Bicycle mural. In conjuction with Penang’s Georgetown Festival, certain old walls within our dear capital has gained a new lease of life, thanks to the awesome efforts of Lithuanian artist, Ernest Zacharevic. I went to KLCC for my first time when I was a student. I was so excited and amazed about the mega-structure. However everything was so pricey for me. I barely found food below RM10, the parking fees also can easily go more than RM10. And so goes the souvenir. As we are on a tight budget, we would rather bring our own food and beverages but to buy them at KLCC. FYI, Level 2 food court is also known as 'Signature' while Level 4 are also called 'Rasa'. If you observe carefully, actually there is food in KLCC that worth less than RM10 and full-filling available at both 'Signature' and 'Rasa'. If you go to 'Signature', go and find the mamak stall called 'Hameed'. Their basic nasi kandar worth RM5.50. And if you go to 'Rasa' go and find mamak stall named 'Nasi Kandar'. Their basic nasi kandar worth RM5 only. The cheapest in KLCC. it's actually originates from Penang. 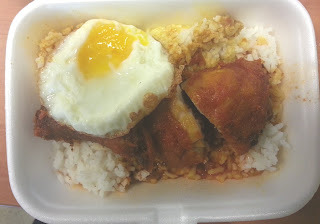 White rice served with mixture of curries. Basic means you'll get fried chicken, crackers and fried vegetables. Of course you can have them with seafood and lamb depending on your choice. Well worry no more, now you can save your money for something else. Be prepared tonight. Either you want to stay up or wake up early in the morning to grab your tickets. As preparation, check the public holiday calendar from 20 August 2013 - 9 February 2014. Year 2013 is coming very soon!!! MAS is now having an Enrich promotion. With just 50% from normal Enrich point, now we can go for holiday to any promo destination. Hurry up as the promotion is only up to 31st December and travel period is from 1 Feb 2013 - *30 Jun 2013.